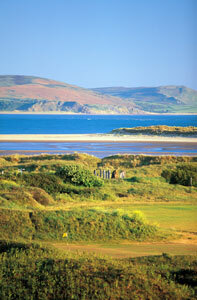 Ashburnham is one of the finest and oldest golf courses in Wales, founded in 1894. It’s located close to the Burry Estuary and Worm’s Head with fine views over Carmarthen Bay. A number of important events have been hosted at Ashburnham, including the PGA Championship. Bernard Gallacher picked up his first pay cheque here, when he won the 1969 Schweppes PGA Championship. Sam Torrance and Dai Rees were also victorious at Ashburnham. Ashburnham originally started out in life as a nine-hole course and was extended in 1902 to 18 holes. Today’s course, which measures 6,630 yards from the back tees, is the result of alterations by J.H.Taylor in 1914, Fred G. Hawtree in 1923 and then Ken Cotton (himself a member at Ashburnham). These three great architects have created a classic out-and-back links course, rolling gently through the dunes. Unusually, Ashburnham begins with a downhill par three, where out-of-bounds lurk menacingly at the right of the green. In fact, the course is a nightmare for the right-handed slice, as there is invariably trouble beckoning to the right on many holes. The first two holes and the closing two holes are somewhat out of character with the rest, having an inland, almost park-like feel. But the holes in between are the real thing – undiluted and undulating linksland. By the time we reach the 3rd hole, we’re running parallel to the sea and often into the teeth of the prevailing wind. At the turn, we head back, wind assisted but a little further inland. According to local Ashburnham folklore, an extraordinary tee shot was struck on the 18th. During the Home Internationals, an amateur event, England’s John Davis struck his drive from the 18th tee directly onto the clubhouse roof. The ball ricocheted off and landed to the left of the green, pin high! Admittedly, the wind was from behind, but the ball must have travelled at least 400 yards. After a game at Ashburnham, make sure to have a drink in the welcoming clubhouse. The members are friendly and often willing to tell a yarn or two. Above all, ensure that you don’t miss playing this historic links, it’s an absolute delight and it’s guaranteed to put a smile on your face, making you want to come back for more. A fun course that runs in a fairly classic out/back configuration. Played on low to mid dunes there are a few excellent holes on the inward nine. The par 5 that cuts sharply to the right (instead of going on to the 3rd green –wonder how many visitors playing at a quiet time has incorrectly played at this green?) is a great hole nestled in the largest dunes. The par 3s are all good and a terrific 18th as well, requiring a straight 200m tee shot then an awkward uphill shot to the green. Anything mishit could roll a long way back. This is the definition of 4 balls. A consistently good course with a handful of excellent holes. Warren from Aust. The links at Ashburnham contains some wonderful golf holes on a sandy tract of land that has played host to many notable championships. As recently as 2014 it was chosen as a qualifying venue for the Seniors Open Championship and I can imagine that when the wind howls across this narrow stretch of linksland it will provide a test to the very best. There’s no denying this is a true links experience with the sixth, ninth, 12th, 14th and 18th being the real stars of the show in my opinion. This quintet of holes stand-out from the rest as being superior to the others on a course that borders on good-to-very good for the remainder. The reason is perhaps the more pronounced changes in elevation that these holes have in contrast to the rest, which are mostly played across flattish ground, save for a couple of dropping short holes. The routing at Ashburnham is slightly unusual in that the opening two holes and the final three are played close to the clubhouse in a curious configuration. For me the real character of Ashburnham is displayed between the third and the 14th where you essentially play out and back on a thin strip of gently rippling terrain. There’s very little to be critical of at Ashburnham. Many of the holes are structurally sound in the strategic sense and the greens were excellent. Midway through a very dry Spring they were firm, running true, fast and were already starting to get that lovely browny-glaze that good quality links greens are renowned for. If I was forced to nit-pick it would be the bunkering. Not the positioning of them (that was very good) but they were quite tired looking in places and the style wasn’t particularly to my liking. A bunker renovation scheme would no doubt be costly but could transform this course from being very good to excellent. We played Ashburnham after Pennard in August and found it delightful, very playable and lots of fun. The greens were superb, and the course contains plenty of interest and variety. There are a couple of quirky holes. At 14 you cross to another fairway semi blind, and 18 a bit daft, but the overall experience is very positive and enjoyable. Very friendly and welcoming. We played Ashburnham as part of a trip to South Wales on which Royal Porthcawl and Pennard were the highlights. We stayed and played at the club which as usual was a nice experience and good value with excellent food. The course was very enjoyable, with some solid links holes and an excellent match play finish. The 18th was definitely a highlight, very difficult elevation change, and gets you back to the bar. Well worth a game. I played at Ashburnham on the weekend as was once again really impressed. The excellent growing conditions this year meant the course was in great condition with good definition between fairway and rough and first class, smooth (but slightly slower than expected) greens. The view over the estuary and the Gower peninsular from the clubhouse whets the appetite, and although the first 2 and last 2 holes beklow you are not everybody’s favourite, for me they only suffer in comparison to the rest of the course. The 1st is a fine par 3, and the second a tough par 4, “spoilt” by the road and the houses nearby, but you’ll always be happy with a par! Once out on the 3rd the course is nothing other than a delight. The standout holes start with the par 3 6th with a raised green and no bail-out, and you then enter the toughest stretch, with 3 holes of great variety and trouble everywhere. The tricky 7th is just over 300 yds but has a low SI for good reason. For non-members the par 5 8th presents a tricky challenge with the second shot, whilst 9 is just a tough par 4 with a green hidden behind a knoll. The pace continues right through to the 15th which is always a tough par 4. The 18th divides opinion and sure a long uphill shot to a raised green is not the best finish, but it keeps you honest right to the end. In summary, a tough track that allows little margin for error, and due to its out of the way location is an absolute steal with a green fee much lower than better courses elsewhere. It’s a bit of a trek for most, but absolutely worth it, and right up there with the best that Wales has to offer. played wed 11th June 2014Awesome layout, good greens, nice scenary, a must visit course. Played Ashburnham after Tenby, Pennard and Royal Porthcawl and before P&K. Regret to say that I hold it towards the bottom of this top group, despite a great stretch on the back nine. The reason for this would be the relative lack of views, the lack of variety, itself partly a function of the out-and-back layout. In its defence the greens were in excellent shape as of early May 2014, and possibly also the fastest of the lot! Another positive for me is the 18th, which really makes you think as it really tempts you to go for it, although you know you should not and (I guess) lay up on the lower fairway section to the right. Did we sensibly lay up? Of course not - and took the punishment on the score-card, of course. As I am sure is the case a lot of the times, the sun shone and the wind blew. This course is a great links and well worth a round. I would say that it is a course made up of a lot of good to great holes, I particularly enjoyed, 3, 9, 12, 13, 14 and 15 are the stand outs for me. My apologies for my playing partner who whilst taking the tiger route on the 18th nearly took the barman out who was taking a well earned break on the putting green. I played this course at the same time as playing Machynys with my playing partners. I do have to say that the course is reasonably wel presented, but beginning to look tired in places. They have 8 or 9 truly great holes, however it feels like some of the holes are there purely to lead you to the next great hole, which is a shame. The facilities could do with some serious updating, with changing facilities and catering tired, combined with decor, however, we were greated very well both in the pro shop bar. Unfortunately this was once a great club, that like many members owned and run golf courses apears to be severly lacking in investment. i intend to return when I come to Wales again, but if there has not been the necessary investment this plan may have to change. I thoroughly enjoyed my game here last week. None of the holes appeared out of character with others which may be testament to the rains of 2012. The course is a collection of lots of good holes and my personal favourites were the 9th with bunkering all the way down the left of the hole and the 14th which is a par 5 with two sections of slightly offset fairway which has a run out at 290 yards from the white tees and a perfectly placed bunker on the right hand side of the fairway 50 yards short of the green.The only weak hole is a disappointing finish on 18 with an approach to a green well above the level of the fairway which makes the approach more difficult than the yardage suggests. As is the case with many courses, a little TLC to raise the condition of the course would be welcome but with many clubs/courses struggling financially this is unsurprising.I have never seen a fleet of members buggies (there must be 50+) such as that at Ashburnham on what is a largely flat course. Having climbed to the 16th tee and 18th green I understand why the fleet exists.